← Lil’Peckers 2011: The Revolution! Just about every night last week I’d been on the verge of heading to the hospital, but ultimately, I never felt pains serious enough to pull the trigger on Team Baby. This time, instead of just going to the hospital and feeling silly, false labor would entail packing up Molly and taking her to Padulas, getting the goats, chickens and dogs stocked with food and supplies and a whole host of logistical embarrassments I hadn’t been willing to risk. I needed some Serious Cramps before I’d demand Seth take us to the hospital. I got my wish around 6 a.m. Saturday. Seth said he knew something was up when he saw me come down the stairs at 6 a.m. on a weekend. (This is because I am lazy and tend to sleep in.) Knowing it would be much, much easier on the world if we had a baby NEXT weekend, I tried to ignore the situation for almost two hours before we executed plans to drive 50 minutes to the hospital. After we dropped Molly off at Team Padulas, Seth and I made a leisurely trip to Dublin, chatting on the way about how if I wasn’t properly dilated, maybe we’d go to the zoo or Der Dutchman while Molly was with Rebecca. (MWAHAHA, Rebecca) We also discussed how much more calm we were than the last time. Circa 2009, I would’ve spent the last 4 months pouring over pregnancy and labor books, obsessing over every detail of my ‘Birth Plan,’ worried sick about the pain of getting a Life Bomb into the world. This time we were like, “How much grain should we leave with the goats?” and “Who has the infant car seat again?” It was much more chill and our concerns were 100 percent more practical. I arrived at the hospital at about 4 cm dilated, and almost immediately upon arrival my contractions started lessening in frequency and intensity. The docs sent me on an hour-long walk to see if I’d progress, which, for the uninitiated, means you have 60 minutes to make your cervix an additional 1 cm dilated or they will send you home. There was a lot of squatting and eyeing the bamboo decorations wondering whether they could be fashioned into a tool to break my water in that 60 minutes. I did not want to get sent packing. It was a long commute. Faced with the realization that I might NOT have a baby that day, and that I might be sent back home in shame to collect my child and try again later, I became a bit annoyed. After great introspection and a series of exercises in maturity, I decided it was okay to be sent home for false labor. No sense forcing an eviction before Little Girl was ready to come into the world. Maybe we could go to a matinée! I had accepted my fate when they came in and told me that during one of my contractions, the monitors indicated that Ellie’s heart rate had decelerated, and that this “event” was enough to warrant additional monitoring before they sent me home. Meanwhile, the rest of Team Baby is waiting to be deployed. So I wasn’t in labor-labor enough to stay and have a baby. I was only in labor enough to cramp uncomfortably through non-labor while lying flat on my back so that baby could be monitored. This is one of the least ideal scenarios imaginable. Hours went by with really no plan or indication that I would be having a baby that day. Just uncomfortable cramps. Flat on my back. I became unruly and got up off the bed and started moving around despite what the nurses told me. Around 2 p.m., Ellie decided that she had had enough of this crap and would be coming out now. My contractions went from ‘Do Not Ignore’ to ‘ScreamingBloody Murder into the Night,’ and no one on the medical staff seemed to notice. About the time I had Tweeted “My country for a cervical exam,” my midwife came in and informed me that I was 7 cm dilated. Better call in the cavalry. This was 2:37 p.m.
Luckily, long before this call was made, my mother and sister had become so bored waiting for me to tell them what was going on that they got in the car and drove to the hospital. Still, it became evident really fast that even they might not make it for the delivery. Meanwhile, Seth’s mama, who was also planning to attend the delivery, was waiting for her call to deploy. It was a very tenuous time for Team Baby. Seth held my hand with fervor as 7 cm turned to 9-10 in a second or two and everything got really frantic. I asked for Nubaine but the nurse told me I was doing fine. I did not protest. 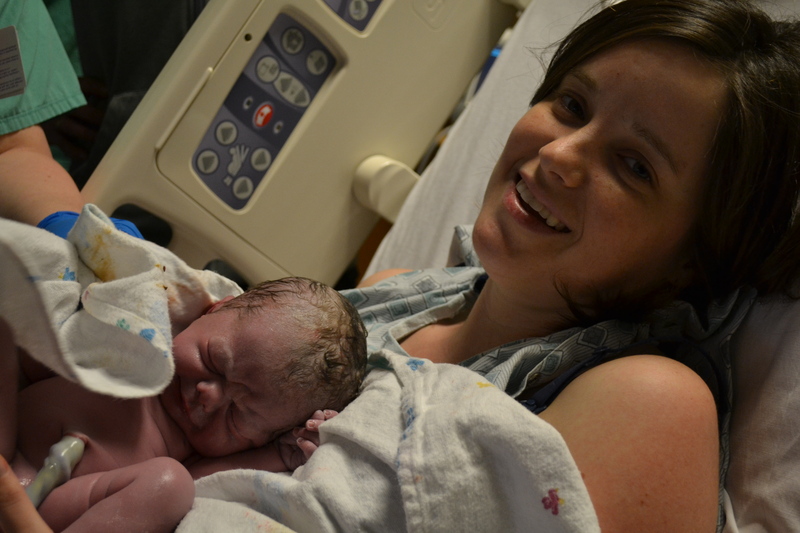 Natural labor, as it turns out, can be more unpredictable than even those Pitocin-induced deliveries I love so much. Right up till the end I had the wherewithal between contractions to realize that my baby was coming out and that mom and Amanda were en route. The doctor made fun of me for calmly looking through the address book on my phone so Seth could call them and see if they were anywhere near the hospital while I was 10 cm dilated. Seth made the call and it turns out they were in the parking lot. Seth said that I immediately started screaming “God, God Goooood!” which I feel a little bit bad about, but within like 2 and a half pushes — maybe two and a half minutes? — baby Eleanor was thrust into the world. This miraculous event did not occur before my water broke, and made a sound similar to that of a shotgun blast. I thought the baby had exploded, and Seth said that it looked like I had thrown a water balloon at the midwife, who did not flinch, but rather, handled the situation with such calm demeanor that it transferred to the rest of the room. Girl has been hit with amniotic fluid before, that’s for sure. I’m just glad it wasn’t the sound of the baby exploding. Birth is weird. I guess that means I’m getting good at this. Can’t wait to do it again nine months from now! Go you for getting the birth story (with pics!) up already. I still have the notes from Dodge’s birth. Maybe I’ll get around to it while I’m in the hospital delivering the second one. She is such a cutie. Congrats again. Gorgeous baby! Great job, Mama. 10 points for successfully executing Twitter post during labor!